On Friday, August 12, a federal judge in Milwaukee overturned (pdf) Brendan Dassey’s murder conviction, giving the state 90 days to decide whether to retry him or release him. 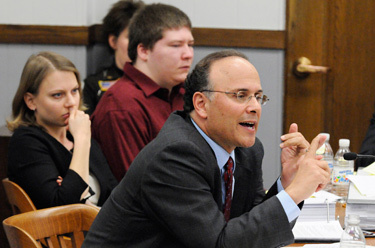 Professor Laura Nirider, left, and Brendan Dassey, center back, listen as Professor Steven Drizin, right, questions Calumet County District Attorney Ken Kratz (not pictured) during a post-conviction hearing in Manitowoc County, January 15, 2010. "Dr. Martin Luther King said that the 'arc of the moral universe is long, but it bends toward justice.' It has taken a decade but the law is finally bending toward justice in the case of Brendan Dassey. As attorneys for Mr. Dassey, we are overwhelmed by the Hon. William E. Duffin’s 91-page decision granting Brendan Dassey’s petition for a writ of habeas corpus and ordering the State to release Dassey from custody unless within 90 days the State initiates proceedings to retry him. The Court’s decision rests on a fundamental principle that is too often forgotten by courts and law enforcement officers: interrogation tactics which may not be coercive when used on adults are coercive when used on juveniles, particularly young people like Brendan with disabilities. And when these tactics are used on juveniles, the risk that a young suspect will give a false confession increases exponentially. In this case, the Court held that numerous promises of leniency were used by investigators to cause Brendan to make a confession that was coerced. Importantly, the Court also expressed 'doubts as to the reliability of Dassey’s confession.' We look forward to taking the appropriate next steps to secure Brendan’s release from prison as soon as possible and are thrilled for him." Dassey, whose case rose to national prominence in late 2015 when it was featured in the Netflix documentary series Making a Murderer, has been represented by the Bluhm Legal Clinic’s Center on Wrongful Convictions of Youth since 2008. Nirider coauthored the petition for writ of habeas corpus that led to the decision to overturn by Magistrate William Duffin. The court found Dassey’s confession in the murder of Teresa Halbach was involuntary, in violation of the Fifth and Fourteenth Amendments. Listen to Drizin and Nirider discuss the case—and youth interrogation and false confessions more broadly—with Northwestern Pritzker School of Law Dean Daniel Rodriguez on the new Planet Lex podcast. Read more about the work of the CWCY and how you can help.